Watercolor on paper. Signed and dated: 15.2.84 Richter' (upper left). Oil on canvas. Monogrammed on the bench: f. B 39 x 30cms. (15 ¼ x 11 ¾ in.) PROVENANCE: Collection Jean-Baptiste Lemoyne, his posthumous sale, 10 August 1778, lot 18, 1220 pounds (sold together with its apparent pendant, Le sculpteur dans son atelier, actually by Jean Baptiste Marie Pierre); Pierre-Hippolyte Lemoyne, architect, his sale, 19 May 1828, lot 74, 120 francs; Comte de Pourtalès-Gorgier, his posthumous sale, 27 March-4 April 1865, lot 228, 7 000 francs; S.E. Khalil-Bey, his sale, 16-18 January 1868, n°72, 14 000 francs; A. Hulot, his sale G.G.P., 9-10 May 1892, lot 80, 25 000 francs; Baron Edmond de Rothschild, Château de Prégny. EXHIBITED: L'Art au XVIIIe siècle, Galerie Georges Petit, Paris, 1883-1884, cat 17 (collection de Mr Hulot.) LITERATURE: Ed. and J. de Goncourt, L'Art du XVIIIe siècle, Paris, 1880, Vol. I, third edition, p.199, ‘Vte Collet’; A. Michel, François Boucher, ‘Les Artistes célèbres’, Paris, 1889, p.96; G. Kahn, Boucher, Biographie critique, Paris, 1904, rep. p.44 (with location mistakenly given as the Louvre); A. Michel, François Boucher, catalogue by L. Suillé and Ch. Masson, Paris, 1906, cat. 1129 et 1230; P. de Nolhac, François Boucher, catalogue by Georges Pannier, Goupil & Cie, Paris, 1907, p.37, ill. opp. p.10, cat. p.143; H. MacFall, ‘Boucher, the man, his time, his art and his significance 1703-1770’, The Connoisseur, special edition, 1908, ill. p.144; P. de Nolhac, Boucher, premier peintre du roi, Paris, 1925, p.76, ill. opp. p.76; A. Ananoff, ‘Attributions et identifications nouvelles de quelques dessins de François Boucher et de Gabriel de Saint Aubin’, (communication of 16 octobre 1965) Bulletin de la Société d'Histoire de l'Art français, 1965, pp. 175-176; Regina Shoolman Slatkin, François Boucher in North American Collections, 100 Drawings, exhibition catalogue, Washington and Chicago, 1974, under cat.33; A. Ananoff, François Boucher, Lausanne, 1976, vol.I, p. 209, cat.76, fig.338 (as by Boucher and Pierre); exhibition catalogue, François Boucher 1703-1770, Paris, New York and Detroit, 1986-1987, under cat. 22, pp.150-151. 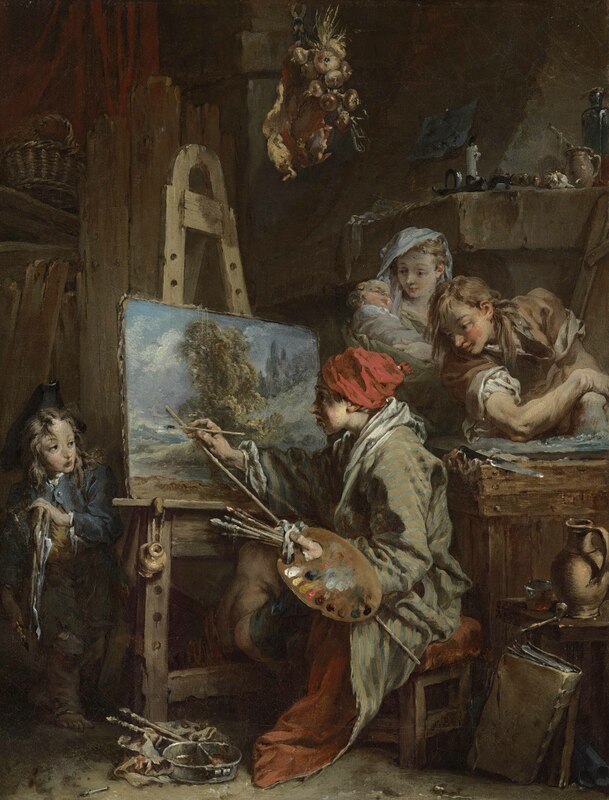 Described in the Jean-Baptiste Lemoyne sale as ‘un joli morceau plein de gaîté et d'agrément’, this remarkable canvas depicts a painter’s studio, one which the Goncourts, André Michel and Nolhac were all pleased to describe as Boucher’s own, with the artist dressed ‘in a dressing gown and cotton cap à la Chardin, seated in front of an easel, with all the clutter of work around him, his wife, a child in arms, looking over his shoulder and two young boys, one mixing colours and the other holding a portfolio’1. The 1828 sale catalogue of the architect Pierre-Hippolyte Lemoyne had first proposed an autobiographical interpretation of the canvas: ‘the painter is François Boucher himself; the young pupil is Deshays …..the young woman is madame Boucher’, though this had been absent from the sale following the death of his father Jean-Baptiste Lemoyne in 1778 and Ananoff much later demonstrated that the age alone of the figures depicted precluded this delightful but fantastic description from being an accurate one. A tour de force of brushwork, concentrated onto a diminutive canvas, the picture demonstrates the exuberance of Boucher’s technique at this relatively early point in his career. Ananoff’s erroneous suggestion that it was the work of two hands, Boucher and Jean-Baptiste Marie Pierre, has been firmly dismissed by both Alastair Laing and Nicolas Lesur (co-author of Jean-Baptiste Marie Pierre 1714-1789 Premier peintre du roi, Paris, 2009), who separately explained that Ananoff’s mistake was based on a misunderstanding of the catalogue of the Lemoyne sales in which two paintings were placed in the same lot as Tableaux executes par M. Pierre & M. François Boucher. Ananoff illustrated a poor quality reproduction of the work and it may be that he never saw the original, suggesting instead that the small blank space in the legend on the 1752 engraving of the composition: Peint par Boucher de l’Acad. Rle de Peinture should have been filled with the name Pierre and an et - rather than the more logical François. As Alastair Laing also pointed out, by placing the Le peintre paysage in the year 1732, Ananoff was in any case ruling out the possibility of Pierre (1714-1789) being a co-author. A drawing of the little boy holding the portfolio was published as connected to the painting by Ananoff, provenance given as formerly in the J.P. Heseltine collection (where it was attributed to Watteau).2 In a somewhat smaller painting on panel, now in the Musée du Louvre, again entitled The Landscape Painter3, Boucher depicts a younger and even more bohemian artist, painting alone in a garret. A drawing in the Los Angeles County Museum studies the composition of the Louvre painting but the artist is older than the one in that painting and the model is clearly the same as the young man in the present picture, though seated in reverse4. These works all appear to belong to the early 1730s and show Boucher exploring the theme of the painter at work, using a playful but at the same time virtuoso manner. Boucher was also perhaps wishing to highlight the deprivations suffered by young artists, thereby prefiguring a theme which became much more common in the 19th century. The Louvre panel though small in scale has the conceit of using the composition of an actual capriccio landscape by Boucher5, depicted in remarkable detail, for the canvas on the easel. The present work, again with its exceptional detail shows another clearly realised painting within a painting but also the wonderful elements of still-life which are gathered in the disorder of the studio: paints, jugs, baskets, onions hanging from the ceiling, candles and books; the studio is in fact, surely, a kitchen. Anecdotal and picturesque, if not exactly realistic, this picture belongs with a small number of genre scenes all seemingly painted prior to 1735; these include La belle cuisinière in the Musée Cognacq-Jay, and the lost La belle villageoise known from a 1738 engraving by Pierre Soubeyran. As the 1986 catalogue to the François Boucher exhibition writes of these aforementioned compositions, ‘It is in the teeming detail of the setting and the prominence accorded to the still life that these pictures appear most Dutch’ and yet whereas Dutch genre scenes tend show the protagonists as ‘exemplifications of a social type, in Boucher the purely human interest of the scene comes first.’ Pointing out the mastery of these scenes the catalogue also remarks upon the puzzling fact that Boucher abandoned genre so rapidly even though it gave him the chance to display his virtuosity. Two chief reasons for this are proposed: that Boucher was unwilling to compete against Chardin in such a field and also that the quality of his artistry and technique would not be appreciated by the habitual collectors of Dutch art and genre subjects. Meanwhile, he made this exceptional example, which for its subject matter and for the level of attention he gave to it must surely have been close to his heart. Notes: 1. André Michel, François Boucher, Paris, J.Rouam, 1886, p.96 ‘en robe de chambre et bonnet de coton, à la Chardin, assis devant sa toile, dans tout le feu du travail, plein de vie au milieu de son atelier encombré d'un amusant fouillis, entre sa femme qui, un enfant dans les bras, regarde par-dessus son épaule, et deux jeunes garçons dont l'un broie des couleurs, l'autre tient un cartable’. 2. See L’œuvre dessiné de François Boucher, Paris 1966, cat.545, p.151 and fig.102, Study: Head of a Child and Two Hands, black, red and white chalk (trois crayons), 215 x 150 mm. 3. See exhibiton catalogue, op.cit., under Literature, 1986-7, cat.21 and fig.105. 4. Los Angeles County Art Museum, inv. 59.37.1, red chalk heightened with white, 362 x 267mm. 3. Le Berger Napolitain, now lost but known from an engraving by Daullé made when it was in the collection of the chevalier de Damery.